The Reloop Beatmix 4 is a performance-oriented 4-channel pad controller for Serato. Both Reloop and Serato have teamed up, to develop a ‘fun to use’ 4-Channel controller for the worldwide popular DJ software Serato to work seamlessly plug ‘n’ play: Connect and start mixing. 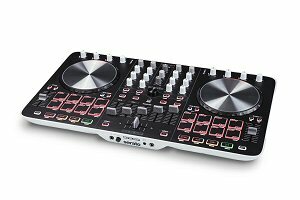 The Beatmix 4 comes with the 4-deck version of SERATO DJ Intro out of the box. Beatmix 4 is a winning package combining extensive mixing functions and a well thought out performance pad section – all at a very attractive price.